This is Part II of Building Bulletproof Brands, a series that explores how the internet destroyed traditional moats for physical goods brands but created new ones that are stronger than ever before. Read Part I if you haven’t yet. Part I explored how the internet fundamentally changed the playbook for building durable physical goods brands. Before the internet, mastering product, brand, distribution—signified as (product + brand + distribution)—was enough to make a brand defensible, specifically in the apparel, fashion, footwear, beauty, cosmetics, accessories and furniture space. Additionally, a small set of brands, usually in the luxury space, built their companies on (product + brand + distribution) x community. Companies that built communities are more defensible than ones that didn’t, but keeping these communities intact and enviable is unscalable. With the internet permeating every aspect of daily life, in addition to reshaping the entire commerce landscape, these old formulas are no longer enough. Part II presents a new formula for building bulletproof consumer goods brands post-internet and showcases how Supreme, Glossier and Peloton are putting this new approach into action. Before diving into the new formula for building bulletproof brands, it’s worth exploring the difference between a community and a network. A community is a group of people that share something in common. People join communities but participants don’t often exchange value. One type of community is a surface community, which is a top-down group that is centrally controlled and directly linked to a company’s product. Part I signified this as (brand + product + distribution) x community. The problem with this approach, which Hermés and many other luxury brands employ, is that it’s mostly static. There’s no guarantee that the community gets stronger as it grows. In fact, the opposite often happens, especially for luxury brands. The brand and community grow less powerful as the company expands because increasing the supply of a scarce product dilutes its value. These brands have to carefully manage growth, and often do so by enacting artificial production limits and destroying unsold merchandise. This formula, and the idea of a community itself, was created before the internet existed. A network, on the other hand, is a group of people that are interconnected, which increases in value as more people join. Members of a network are constantly exchanging value and contributing to the greater goal. Networks are foundational to our post-internet world and they come in many different shapes and sizes. The global telephone network, for example, increases in value with every new person that buys a phone and claims a phone number. Networks take the idea of a community and push it to the next level by increasing connectivity. Recent technological and communication advances enable new types of networks. One of these is called a hive, which is a decentralized network that allows for greater coordination and action. A post called “The Hive is the New Network” outlined the concept of a network that is bigger than the sum of its parts and lacks any centralized control. A hive allows participants to 1) effortlessly take action by increasing the frequency of interactions; and 2) act collectively and grow closer together by decreasing the friction between interactions. As the participants interact more frequently and effortlessly, the hive grows smarter and more agile, without any central authority determining every move. Whereas surface communities are constrained from scaling because of their top-down composition, a hive can scale and adapt much more quickly. A hive uses word of mouth and a range of other physical and digital communication methods to spread. The absence of friction from a controlling entity allows the hive to grow stronger than a sanctioned network. A hive is always evolving. Given our modern reality, the new formula for building bulletproof brands is (brand + product + distribution) x networkx. The new and most important addition is networkx, which signifies the hive: the more people join and interact, the stronger the hive—and therefore the brand, product, distribution and overall company—becomes. When a product or service is built alongside a hive, it creates a virtuous cycle. The more the hive grows, the better the product becomes, the more the brand resonates and the easier it is to distribute. 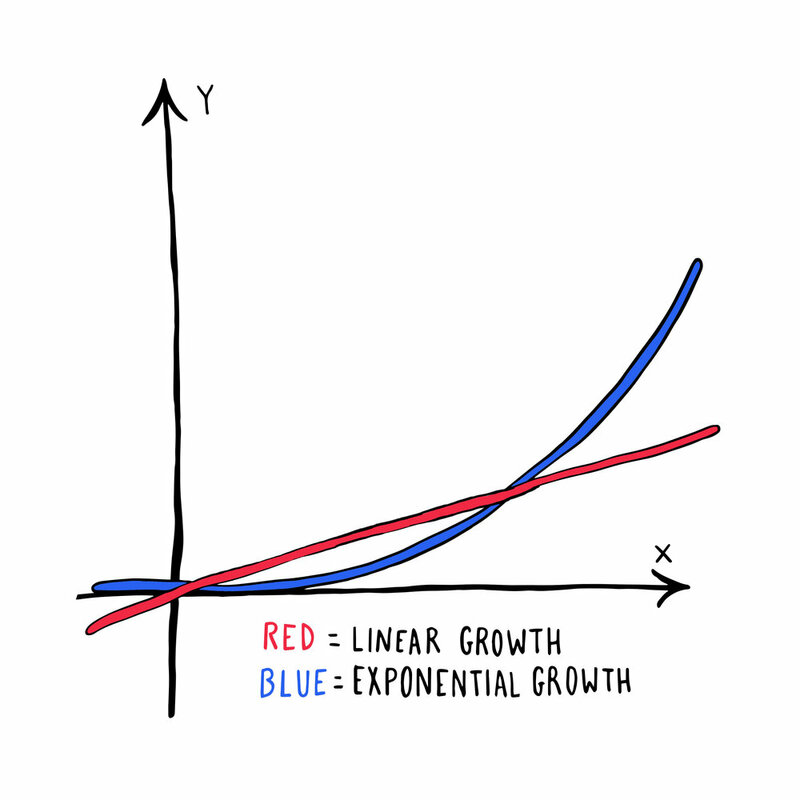 While a community might be able to grow linearly (signified as x(x)), the hive grows exponentially (signified as x x). Hermés’ surface community, for example, can only grow at the rate that the brand sells its product. Every time a new customer buys a product its community grows by one. Surface communities have a one to one relationship to sales, and thus grow linearly. The product precedes the community. A hive, conversely, can grow independent of the product itself, and a shopper’s involvement can often precede a purchase. Unshackled by this constraint, hives grow exponentially. Today, brand, product and distribution are increasingly commodities. Surface communities, which are built on weak ties, are hard to manage and are naturally constrained. A hive, however, is highly defendable and nearly impossible to commodify. Any company can rip off the design of a product, copy branding or secure similar distribution, but it cannot steal the virtuous cycle that makes a powerful, naturally growing network thrive. This is why Facebook is entrenched as the world’s largest social network, with a litany of products besides Facebook.com (Instagram, WhatsApp, etc) underpinning its position. The more people that are on Facebook’s platforms, the more valuable its networks become, and the harder it is to dislodge them. Physical goods companies used to compete on product, brand or distribution. A hive shifts the playing field to the network, which becomes the main focus and the most defendable part of the company. Importantly, this new formula is not isolated to the luxury market and doesn’t need artificial constraints on supply to thrive. Rather, the hive derives its power from its decentralization and lack of top-down control. Supreme, Glossier and Peloton are three promising examples of this new paradigm in action. Supreme is one of the most interesting franchise brands today. James Jebbia founded the company in New York in 1994 as a haven for skaters. Instead of releasing its products in big collections a few times a year, Supreme releases a few products in weekly drops at 11am every Thursday, a move that has been compared to “morphine [dripping out] through an IV.” Supreme aligns with Buffett’s definition of a franchise. It has 1) total pricing power over its products, which are 2) in incredibly high demand and 3) impossible to substitute. While product is important to Supreme, the true differentiator is its obsessive network—its hive. Members of Supreme’s hive line up hours and days before product releases, use computers and bots to scoop up products at all hours of the night, and maintain a thriving secondary market that has the liquidity and volume of a small stock exchange. Supreme’s hive has three unique elements: 1) the brand’s secondary market; 2) the litany of bot vendors; and 3) the brand’s collaboration strategy. The secondary market for Supreme’s products compounds the virtuous cycle between its brand, product, distribution and network. Since products come out in highly limited quantities, which are available online and in a handful of Supreme stores around the world, the after market potential for the brand’s products is vast. Tens of millions of dollars move through this secondary market annually. But Supreme has virtually no control and captures no direct revenue from it. The brand’s lack of involvement in its secondary market leaves millions of dollars on the table every year, an acknowledgement of the powers of decentralization. Yet the demand for Supreme products, especially older ones, continuously fuels the hysteria. The explosion of vendors selling bots that help Supreme fanatics buy its products every Thursday is rare for physical goods brands. Supreme products come out in very limited quantities, with demand vastly outstripping supply. Most products sell out in one or two minutes, often the result of millions of shoppers vying for the same products. To beat the rush, people started developing software bots that have mastered the structure of Supreme’s website and programmatically complete the checkout process in a matter of seconds, unlike humans who take minutes to complete the same steps. On a recent drop in December, 2016, Supreme’s website received 986,335,133 page views and 1,935,195,305 purchase attempts, according to Wired. A sizable percentage of these visits are from bots, not humans. It’s one of the only forms of high frequency trading for consumer goods brands, and a cottage industry of vendors with names like The Supreme Saint, EasyCop Bot and RSVP Sniper have popped up to support it. Some vendors are making tens of thousands of dollars while others are making hundreds of thousands of dollars, further evidence of the powers of a hive to stimulate ecosystems independent of the mother brand. Supreme has a love-hate relationship with the bot makers, as it tries to keep them in check, but it has stopped short of banning them outright. Supreme’s prolific collaboration strategy, where it designs, produces and sells products with other brands, shores up support among its most loyal shoppers while vastly extending the network’s reach. The brand has collaborated with other brands such as Nike, Levis, North Face, Louis Vuitton, Comme de Garçon, and even New York’s Metropolitan Transit Authority. These collaborations, of which there are hundreds, allow Supreme to reach exponentially more customers than it would otherwise, since it gains access to its collaborators’ customer base. Supreme’s permissive stance on its secondary market and bot frenzy, in addition to its pro-collaboration mentality, has allowed it to be one of the first consumer brands to empower a hive and reap the benefits. The lack of top-down control over the Supreme network allows all of its shoppers, buyers and sellers to act nimbly and on a much greater scale than previously possible with centralized control. This approach is zen-like in nature, a realization that the act of letting the network thrive by generally doing nothing is the best thing a brand can do. Some checks and balances are important, but that’s a ways away from total control. Another important result of building franchise brands around networks, not products, is that individual products can be scarce but the brand remains accessible. Supreme could print millions of stickers without diluting the brand, since franchise brands are able to decouple the scarcity of product from the potency of the brand. More than that, being part of a hive is more important than owning any individual product. A related benefit is how the hive protects against substitution, which is one of the three pillars of a franchise that Buffett outlined. In many industries, patents, trademarks and copyrights try to deter and prevent substitutes from flooding the market. It doesn’t always work but the threat of a patent lawsuit is sometimes enough to get a competitor to back down. Within the physical goods world—and specifically with fashion, apparel and accessories—patents are much less relevant. This is true for a number of reasons, but two important ones are the generic nature of many products (pants are pants) and the sluggish speed of the patent process (the product could be sold out or retired long before a patent is granted). Traditional legal protection is generally unhelpful. Franchise brands, however, empower members of the hive to act as the de facto defense mechanism, ensuring substitutes are rendered irrelevant. When fake Supreme products flood the market, members of the brand’s hive are the first to sniff out the fakes. Supreme itself doesn’t need to say a word. This approach is much more scalable since it doesn’t waste a brand’s resources playing the game of whack-a-mole required to defend patents and trademarks globally. Instead, the hive renders the fakes valueless and everyone moves on. This is the power of the hive. Supreme remains one of the best examples of a brand that has harnessed the advantages for years. As a result, it isn’t going anywhere. Although the brand is much younger than Supreme, Emily Weiss founded Glossier in 2014 after running her blog Into the Gloss, which she started in 2010 while she was working in the fashion industry. The blog’s most well-known feature, called The Top Shelf, showcases the stories and beauty routines of a wide range of women. During these four years, thanks to these interviews and thousands of comments on the blog’s articles, Weiss built up an immense amount of feedback about women’s beauty routines. She identified gaps in the market and launched Glossier to fill them. The goal, she said, was to build a brand that young people could call their “friend” and be a part of. In just a few years, Glossier has made a massive dent in the beauty world. This has happened for many reasons. Into The Gloss gave Weiss and her new brand a massive platform to start with. The brand designed and packaged its products in a bold and unforgettable manner, to the point that it “owns” a specific shade of pink. However, the biggest driver of Glossier success is the beginnings of an unstoppable hive. There are three distinct elements to Glossier’s hive: 1) how it incorporates customer feedback; 2) how it’s building its influencer network; and 3) the pricing architecture of its products. Glossier started with a deep understanding of the powers of customer feedback, a mentality that has been ingrained in the company since the beginning. Glossier often announces plans for upcoming products on Into The Gloss, which it uses to solicit ideas and feedback. This sometimes happens a year in advance of a product’s release, and results in thousands of comments across the brand’s social platforms. Most famously, this is how the brand developed its first face wash, which concluded in a follow up post announcing how everyone’s feedback helped create the final product. The brand also maintains a Slack group with over a hundred loyal customers who are available for instant feedback on a variety of topics. Most beauty brands want mega celebrities as the global face of their products. This would result in someone named Kardashian signing a massive contract and contractually agreeing to campaigns and appearances. This big brand approach to influencers is highly centralized. Glossier, on the other hand, is much more decentralized in its influencer approach. “What’s very motivating to us is this idea of every single woman being an influencer,” Weiss told Quartz. The brand uses employees and other customers as models in its campaigns, in addition to constantly re-sharing photos and selfies from its army of supporters. This mentality allows customers to connect on a deeper level since the people being held up as aspirational—if at all—are much more “normal” and “friendly” than the untouchability of celebrities. People often ask Weiss how she makes her customers “feel involved,” to which she answers: “Involve her. Don’t just make her feel involved…Reward her if she’s involved. Get her involved and say thank you. Use that information, that feedback loop.” This pragmatic approach has paid dividends for the brand, as participants in the hive play an important role making Glossier bigger than it could ever be without their participation. As a testament to the powers of this mentality, Weiss believes that over 90% of her sales come from customers spreading the brand via word of mouth, rather than paid marketing or customer acquisition. This mentality continues the virtuous cycle between the brand, product, distribution and network that enables a hive to grow and ensure a brand’s longevity. Individual Glossier products range from $12-$34, which is more than the equivalent at a drug store but cheaper than most products at Sephora. This price point is relatively accessible and adds to the brand’s appeal and longevity, rather than subtracting from it. Glossier can scale because of its price point without diluting what made the brand resonate in the first place. Put differently, Glossier is scaling inclusivity, not exclusivity. This is a fundamental shift and is something that most luxury brands can’t do. Glossier’s individual products are still sometimes scarce, garnering waitlists with tens of thousands of customers, but this should change as the brand continues to scale its supply chain. Even so, the company remains rather transparent about issues like stock-outs and the lack of international shipping, taking to Into The Gloss to explain the reasoning and remedies. This is operational transparency, which often goes beyond marketing transparency that many direct to consumer brands employ today. The power of scaling inclusivity is that a brand such as Glossier gets stronger as it scales, as more people buy its products and share their feedback, which drives continuous improvement. When asked about the quality of Glossier’s products, responses are mixed. Some love the products and other think they are bad. Interesting, it’s a testament to the power of the hive that the mixed reaction to the company’s products has had a nominal effect on growth. Decoupling the brand’s success from that of its products is a signature benefit of a network-based brand. While it seems there is room to improve, the feedback mechanisms underpinning Glossier ensure that products will always get better, which is crucial over the long term. Glossier is showing clear signs of the three pillars of a franchise: 1) high demand for its products, 2) the ability to price its product aggressively, and 3) is increasingly hard to substitute, given the power of being part of its network. For Glossier to continue reaping the benefits of a hive, the brand should continue making customer feedback the foundation of everything it does, in addition to growing its decentralized influencer strategy and keeping its middle-of-the-road price point. The biggest opportunity, however, lies in incentivizing its hive to keep growing as more and more people contribute to the network, be it leaving product reviews, posting video reviews on YouTube or referring the brand to friends. Right now, the brand has a straightforward referral program, and has experimented with paying a select group of customers as formal representatives for the brand. This approach is rather old school. It’s similar to an influencer program with a sales commission. However, there are countless opportunities to take this to the next level, which will be discussed in Part III. The third brand with early signs of a hive is Peloton, a company founded in 2012 that sells internet-connected workout equipment, which allows riders to take virtual classes from the comfort of their own home. The company is growing very quickly, selling tens of thousands of its spin bikes at $1,995, streaming millions of classes for $39 a month to over 100,000 riders, and opening up showrooms and cycling studios across the country. Peloton’s bike, which is company’s first product, is a very nice bike, as is the tablet built into it and the software running on it. The cycling instructors seem talented, and come from familiar companies such as Soulcycle, FlyWheel and Equinox. Yet none of these things make Peloton defensible over the long term. Instead, the true magic of Peloton is the network it’s building, connecting people across the world to a common activity, and to each other. Peloton considers itself a software company that makes hardware and media, but it’s also a physical goods brand with retail stores building a hive. The company is increasingly moving towards vertical integration, as it builds its software, hardware and media in house, in addition to managing its retail footprint and logistics. Yet as the company becomes more vertically integrated, it’s also decentralizing many aspects of its experience, which is growing the hive. Peloton’s hive has three distinct elements: 1) its media model that allows decentralized competition at scale without diluting the experience; 2) the company’s open-minded stance towards opening up its media network and hardware; and 3) its interest in using financing to make the bike as accessible as possible. Peloton streams over a dozen live classes each day from their New York City studio. While some members show up in person, the vast majority tune in daily, which creates a ritual and reinforces the habit. The company also lets anyone take a class in its 24 retail showrooms, a realization that avid fans working out on the sales floor are the best salespeople the brand could ask for. During the live classes, a global leaderboard updates in real time for riders to see how they are competing against each other. Whereas most fitness classes get worse as more people join them, Peloton’s model allows an infinite number of people to tune in without diluting the experience, scaling inclusivity in a similar manner to Glossier. Right now, Peloton only allows riders to stream the brand’s own classes. The company has talked to Soulcycle and FlyWheel about having their own channels, and while Peloton was open to it, Soulcycle and FlyWheel have so far declined to participate. Even so, the fact that Peloton is open-minded about allowing new brands to come onto its platform is a good sign about how they are looking to grow the network and build a marketplace on top of their product. The company is increasingly moving towards that of a cable company with multiple verticals, something that will only increase as it adds more spinning, yoga, running and other activities. The company has also experimented with letting riders hack their tablet to watch Netflix and other shows. Peloton took to Reddit to leak the step-by-step process for installing the Amazon App Store and then running new programs, a further testament to its flexible approach to scaling. Peloton also offers different financing options for its bike. This opens up the addressable market of people who can’t or don’t want to put almost to $3,000 on their credit card at once, which is the price of the bike plus accessories and taxes. The company currently offers financing from a few months up to a year, through both a bank and Affirm, but will soon announce a three year financing program that should break open the addressable market for the product. As the commerce industry evolves along with advances in micro-financing, chopping up big purchases into smaller installments will increasingly be an important growth tool for brands selling expensive products. Peloton is spreading like wildfire, much of it driven by word of mouth. As a testament to the brand’s longevity, only 0.3% of subscribers quit each month. This is evidence of the product’s fundamental stickiness, which goes beyond the power of word of mouth. Word of mouth is often considered a defensible part of a brand. However, word of mouth is a distribution mechanism, not a moat. It’s definitely a good start, but it doesn’t guarantee anything. Hoverboards spread by word of mouth but there was nothing defensible about the product or any brand in the space. Word of mouth is simply another (commodified) distribution channel. Supreme, Glossier and Peloton, conversely, use word of mouth to grow their network, recognizing it’s a means to an end, not the end. This gets more people involved in the network, converting them into active participants and then customers. Members of these hives only stick around because of the fundamental benefits and mechanics of the network. Word of mouth itself is inherently agonistic. What a brand does with it makes all of the difference. Peloton is showing clear signs of the three pillars of a franchise: 1) high demand for its products, 2) the ability to price its product aggressively, and 3) its irreplaceability, given its obsessive network. To fully realize the power of the hive, Peloton needs to continue opening up its platform for new classes, brands and riders. Many people have heard about Peloton from devoted customers, which is an early sign of a hive in action. It’s not the only sign, but if a lot of people buzzing about a company is married with a flexible and bottoms-up approach to scaling, a hive can prosper. The promise of (brand + product + distribution) x network x is that it makes a consumer goods company defensible because of its network. Any company can rip off another company’s product, brand or distribution. But a thriving network is nearly impossible to replicate. As the competition in the physical goods space continues to rise, especially as Amazon and fast fashion brands keep growing, brands that want to last for decades and centuries without being commoditized only have one choice. They need to build network-first. How they build this network varies, as evidenced by the three examples above, but the underlying incentives and mechanics are identical. With the new formula for building bulletproof brands in mind, along with tangible examples of it in action, Part III explores how new technological advances are empowering brands to launch hives more quickly and successfully than ever before. This is Part II of Building Bulletproof Brands, a series that explores how the internet destroyed traditional moats for physical goods brands but created new ones that are stronger than ever before. Read Part III.